6 little gems you need to discover the next time you’re in Krakow | SHEmazing! 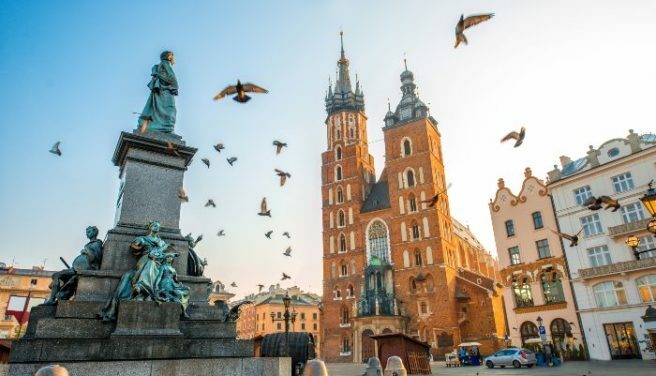 The craic is not hard to come by in Krakow, thanks to the city's extensive selection of clubs, bars and historic monuments and tours. Krakow is perfect for the tourist who can burn the candle at both ends, with chock-a block- daytime activities and then a club scene which doesn't quit until sunrise. You may have to ask around to find the exact location of this hidden little place, but it's just off the square in the old town district. The underground (literally, that flight of stairs is lethal) bar offers unlimited drinks and shots for the one-off price of 60 Polish zlotys, about €13.50. The free drink selection is slightly limited (vodka and apple juice, anyone?) but the cosy atmosphere and two-tiered smoking area make it an experience you literally can't afford to miss. This walking tour talks you through the darker, more specific elements of Krakow's blood-stained history. The tour is completely free, though of course it's only polite to give your tour guide a nice tip at the end. The tour times are somewhat seasonal, with November to February seeing tours every Monday, Wednesday, Thursday, Friday and Sunday at 6pm, and March to October seeing tours everyday at 8pm. Try some traditional Polish foods on the cheap at this food market located right in the square, which is the largest in Europe. You can have a taste of some hot spiced wine, fried cheese, kielbasa sausage and cabbage. There are also plenty of trinkets to be picked up here, from jewellery to leather goods and everything in between. This famous spot has become a must-see on an alternative trip to Krakow. The gritty club is notorious for hosting amazing club nights, and playing host to cool Polish musicians. ToTu is an eclectic but popular bar that gives a bit of a passing nod to Workmans…if Workmans had a penchant for pink velvet interiors. Serving up some of the strongest and tastiest cocktails in the city, this bar is not to be missed on a night out in Krakow. While this is definitely one of the city's most popular tourist attractions, it is, quite literally, hidden. The museum is a subterranean structure that is buried deep beneath the town’s famous square. The museum acts as a final resting place for ancient artefacts, skeletal remains and a maze of walls which were all discovered when the square was undergoing renovations many years ago.